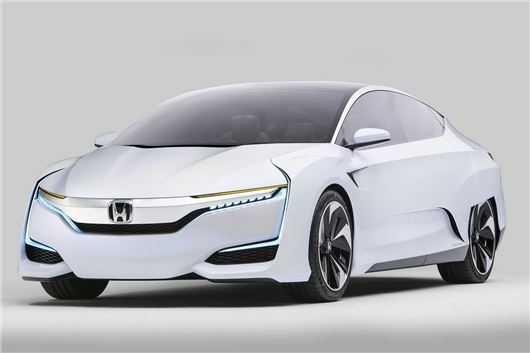 Fresh from unveiling a bona fide supercar, Honda has thrown its lot into the opposite end of the motoring gamut with the FCV Concept hydrogen fuel cell car. The production version is due in the UK before the end of 2016. Honda claims the FCV, when it’s launched in Japan in March 2016, has a 300-mile driving range from a tank of hydrogen – a pressurised tank that will take just three minutes to refuel. Its front-mounted fuel stack is a third smaller than that of the outgoing FCX Clarity, but is 60 per cent more power dense. The styling gives it the air of a two-door coupe, but Honda says the four-door car is a full five-seat family vehicle; the outgong FCX Clarity is a four-seat car, and not an especially spacious one at that. The issue with fuel cell vehicles in the UK is, of course, one of sparse fuelling infrastructure, despite retailers like Sainsbury’s getting involved in hydrogen station trials last year. In the US, where the FCV will be launched in mid-2016 before the European version, hydrogen fuel cell technology is being embraced with significant enthusiasm. Honda will this year provide $14m of financial backing towards the building of hydrogen fuel stations in California, for example.